Red Agency recently launched The RedReads Book Club, which sees us get stuck into an industry-relevant title before sharing our thoughts over drinks and snacks. 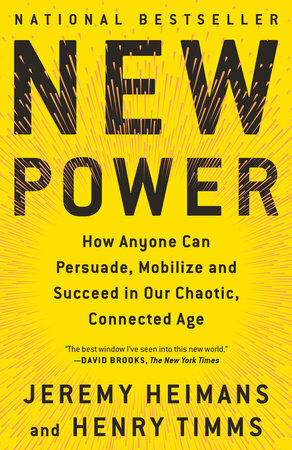 After a close round of voting, the team chose The New Power as its first book, which touts itself as the definitive guide to spreading ideas, building movements, and leaping ahead in our chaotic, connected age. Written by campaigners Jeremy Heimans and Henry Timms, it explores what makes movements like the Ice Bucket challenge and Obama’s election possible. At its core, the book argues that successful new movements shun old power values of formal governance and confidentiality in favour of transparency, leaderless structures and participation. It points out that ‘new power’ movements are all actionable, community-driven and extendable, to allow people to leave their own mark. By increasing the chance for participation, organisations can create a sense of affinity with their campaigns. To give an example, the ALS Ice Bucket challenge’s fast growth came from encouraging people to create and share their own video, giving inspiration on how these techniques could be applied more widely. While these insights may be intrinsically understood, it’s always helpful to be presented with new models to apply to our work. For example, Host/Havas and Red Agency used a participation mechanism to great effect in 2017. By making visitors to the tropical island of Palau sign a declaration in their passports, we compelled people to act in an environmentally responsible way. The campaign won multiple awards, including a D&AD Black Pencil and three Cannes Lions, including two Grand Prixs. At the same time, the book argues that giving too much power to the public can backfire. For instance, when the British Natural Environment Research Council launched a #NameOurShip social media campaign, Boaty McBoatface came out on top — causing a humorous but unintended outcome. Overall, the group agreed that the book articulates and explains its ideas well, and reinforced the understanding that new power tactics should only be engaged if they truly align with the brand.